A recent SHRM survey found that 70% of highly skilled potential candidates are more drawn to organizations with a mobile recruitment strategy. And mobile use continues to soar. As a result, best-in-class organizations are recognizing that recruitment is consumer-facing, and just like many popular brands who master engagement with younger generations, employers must adapt talent acquisition strategies to incorporate mobile functionality that is built to attract and engage desired candidates. 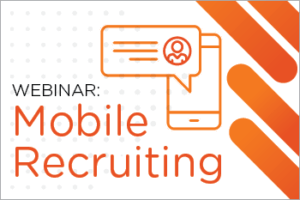 Whether you’re in the discovery stage or have fully embraced the idea of mobile recruiting, join SkillSurvey, iCIMS, and TextRecruit for this on-demand webinar and discover five ways you can master an end-to-end mobile recruitment strategy to help you quickly find and hire top talent for every role.